Chris Robson “could not be more proud” after watching his Buckingham Town side reach the semi-finals of the Buckingham Charity Cup with a dramatic and incident-packed penalty shoot-out win over Olney Town. 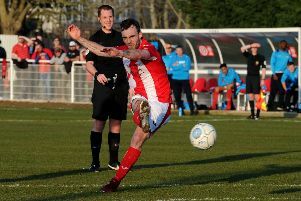 The odds were stacked against Town, particularly after Mitch Brent saw red on just nine minutes, but a determined performance kept Olney at bay, aided by a superb Luke Connell penalty save, and saw the Robins take the tie into extra-time and then penalties. Buckingham also lost Connell to injury, meaning skipper and outfield player Sean Bishop had to go in goal, but that didn’t prevent Robson’s men from claiming a remarkable victory on penalties, winning 5-4, as Bishop, Kotey, Bevis, Bearman and Bines all converted their spot-kicks to set up a semi-final clash against Brackley Town Saints later this month. “I cannot be more proud of the players than what I am at this moment,” said Robson. “To qualify for the semi-final against all the odds given what happened tonight is just incredible. “Our original game plan went out of the window after just nine minutes when Mitch was sent off, so to change so soon after kick off and play 115 minutes with injury time with 10 men it is a massive achievement to progress. “Add to that playing over an hour with no goalkeeper after Luke got injured, it’s just an incredible story.